First person shooters are some of the most popular games on the market today, and have been for well over a decade. But the genre doesn’t always include the shooter part, with “walking simulators” becoming increasingly popular in the past couple of years and even RPGs taking a stab at the perspective. So, where did it all begin and how did we get to where we are now? Strap in for a wild ride through the first half-decade of first-person gaming history. What’s the earliest first-person game you can name? Take a moment to think about it, we can wait. You probably said Doom or Wolfenstein 3D which is completely understandable for reasons we’ll get into later. 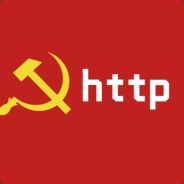 Now what’s the earliest first person game you remember that isn’t a shooter? You probably just chose 3D Monster Maze or Dragon Quest for its battle scenes, maybe a flight sim. Allow me to take you back to an age of psychadelics, lava lamps, and questionable fashion choices in order to blow your mind. That’s right – we’re heading to the flower power loving ’70’s! Back in 1973 we find the origins of first person games, the grandfather and grandmother of everything that came after. It’s not quite clear which actually came first but Spasim and Maze War are both the earliest known first person games. Arguably, Maze War came first in 1973, but due to its development not being well documented Spasim gets to take the official first spot with its development in early 1974. So these were what? Faux-3D novelties? Not quite. Maze War started life as Maze with players attempting to navigate a maze in first person, it was a single player game and no doubt managed to be utterly phenomenal to those who got their first glimpse of first person gaming in an age when bell bottom pants were still cool. The maze was rendered in monochrome using a fixed perspective, something that would become incredibly popular with developers wanting to make first person games on the restrictive hardware of the next two decades. It would have been a monumental achievement if the developers had stopped there, but these men were determined to take their futuristic little program as far as it could possibly go. 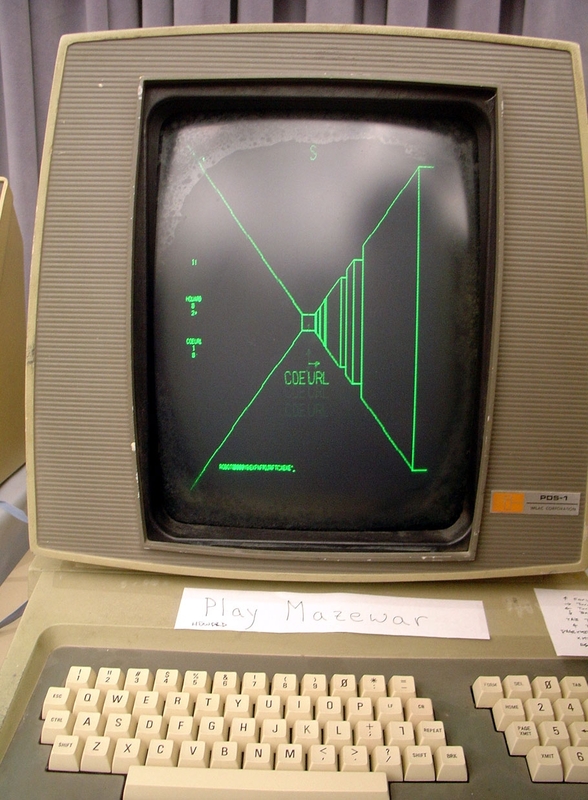 Enter Maze War; originally played with two computers directly connected via serial connection it allowed two players to go head-to-head, shooting at each other to score and deduct points. This brought about multiple other innovations such as having a map that depicted players locations that wasn’t the main field of play (basically a precursor to all the overlay maps, separate map screens, and minimaps of the modern era.) Players were also depicted as various avatars including floating names and eyeballs in some versions, a dedicated level editing program, and two things that are crucial to the modern FPS scene: multiplayer via a dedicated server running on an ARPANET (Advanced Research Projects Agency NETwork) mainframe and client programs connecting to play together and spectator mode which in this case was a separate terminal was connected as an observer. Pictured: Maze War running on an Imlac PDS-1, a very fancy piece of kit for its time. Given the modern push towards listen servers, peer-to-peer and matchmaking it might be surprising to some younger gamers that these technologies weren’t always the norm. Dedicated servers would go on to dominate the competitive gaming scene for the next three and a half decades, finally going the way of the dodo with publishers demanding more control over the experience players get in their digital playgrounds. Meanwhile serial connections would live on in console gaming, more specifically handhelds such as the Gameboy and Virtualboy would use it to excellent effect. Customizable avatars are also now very common. Many of us could be forgiven for believing Doom 2 or even Quake pioneered this feature but the truth is they were a solid twenty years behind the curve – which is more like an F-Zero acceleration graph if truth be told. Competitive games like Quake also helped popularize spectating, whether it was the eliminated players crowding around two machines at a LAN party or curious players watching a match online. That’s one serious legacy – a huge amount of features most of us would assume were created in the latter half of the ’90’s are actually two decades older. 3D Monster Maze wasn’t the only game in town so to speak; Spasim was also making waves at the same time and has a legacy all of its own to explore. 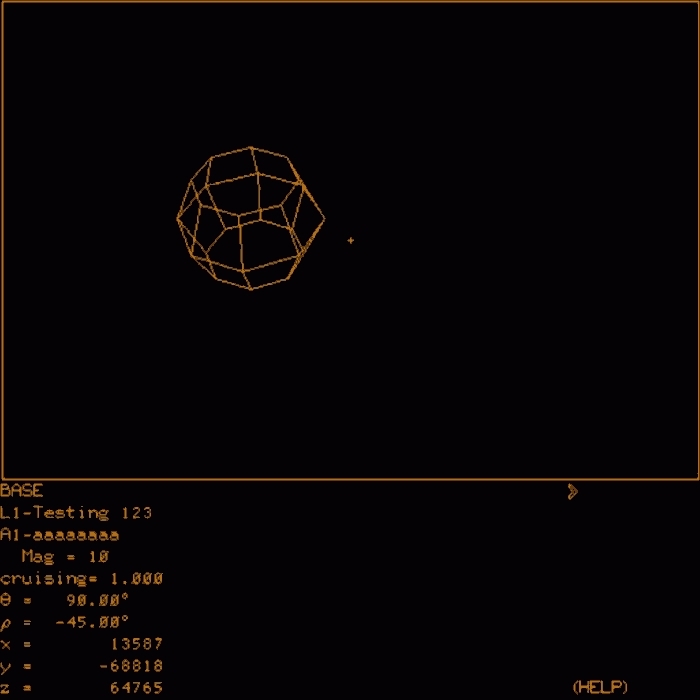 Spasim was developed by gaming pioneer Jim Bowery and as one might expect the name is a portmanteau of Space Simulation. It ran on the PLATO/ILLIAC 1 system at Illinois University. In Spasim players can explore several planetary systems and attempt to shoot other players. To understand why this is incredible we need to take a look at those two unexplained acronyms earlier in the paragraph. Join me as I venture down the rabbit hold of even earlier computing and emerge in the halls of Illinois University’s Technology Institute circa 1974. Our first acronym, PLATO stands for Programmed Logic for Automated Teaching Operations and is a precursor to what we’d called educational computing today. Computer assisted learning was a revolution in the ’70’s – the ability for demonstrations to be made without a teacher performing a physical experiment. It also facilitated the development of multi-user experiences, only one of which is gaming. PLATO and the developers working with it are responsible for many modern concepts like chat rooms, instant messaging, email, ASCII art (formally known as picture languages,) and message boards in their various forms. 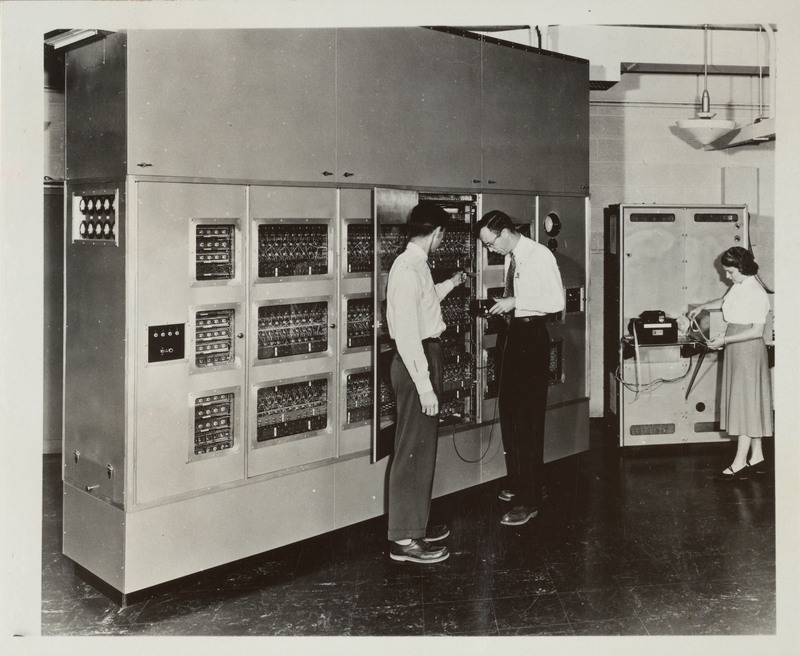 ILLIAC-1 was built in 1952 and was the first computer built and owned by a US education establishment. PLATO runs on ILLIAC. PLATO ran on the ILLIAC 1 (ILLInois Automatic Computer) mainframe build all the way back in toddler years of the atomic age. September 1, 1952 was the day Skynet, uh, ILLIAC 1 went live. But it wasn’t the first of its kind: ORDVAC (ORdnance Discreet Variable Automatic Computer – itself not even close to being the first) holds that honour by seven months. They are however identical and could share programs with each other thanks to using the same instruction set – a revolutionary concept at the time. This is all in the age before microchips too – these machines were comprised of vacuum tubes. Now that the stage is set we can return to Spasim with new appreciation of the fact that it allowed thirty-two players to exist in the same virtual space simultaneously. This is partially thanks to the mainframe/terminal setup of PLATO – the program, Spasim is actually running on ILLIAC 1 while terminals are only sending and receiving information and displaying that information to the players. The players positions would update about once a second, making it a remarkably fluid experience for the time. As one would expect, nerd culture was alive and well at the Technology Institute and much like its predecessor Empire, Spasim features depictions of many popular space vessels such as Star Trek’s Enterprise (“No A, B, C, or bloody D!” – Scotty) and even weapons such as the phasers and photon torpedoes from the same legendary show. Other staples like the Klingons and Romulans also make an appearance, though the wire-frame models don’t make it easy to tell which is which because, being a very early example of this type of 3D graphics, it doesn’t feature hidden line removal. This means that every object in the game is completely transparent and you can see the lines on the side of the object that should be obscured. As TV Tropes is happy to point out Spasim is the trope maker for true 3D videogaming. Not bad for something you probably didn’t know existed until ten minutes ago. Spasim was, to the best of my knowledge, unique at the time for allowing not just two teams but rather four, one for each planetary system. Players also had a more complex set of goals than similar competitive games too; aside from shooting at each other pilots in Spasim were expected to work together to reach distant resources while protecting and managing their own territory. The graphics may not be exciting to look at but anyone playing modern space simulations like Elite Dangerous or Star Citizen will be familiar with the premise. Lastly, Spasim has another impressive legacy. Through a series of inspired programmers Spasim helped birth Flight Simulator. Yes, the Microsoft published behemoth that’s got more versions than hot dinners has one of the longest pedigrees, dating all the way back to 1979 and 1980 when FS-1 was released for the Apple 2 and TRS-80 computers respectively. Vehicle simulations were very popular at the time, as evidenced by Spasim and Airace (great-grandpappy to FS-1) but flight wasn’t the sole domain of the 3D simulation. 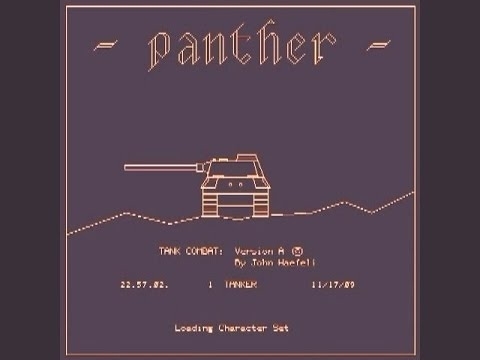 Panther a 1975 game by John Edo Haefeli took to simulating driving a tank in a battle. It’s at this point that it’s worth noting that simulations of the time were more concerned with simulating the experience of taking part in fantastical things rather than the more modern simulation obsession with minutae. That’s not to say that Panther doesn’t allow for some surprisingly intricate details for the time. The turret and chassis of the vehicle can be rotated independently and several views are available. Ammunition, fuel, and mines are all in limited supply. In addition to defeating the enemy tanks, players must also attack and defend bases and start in a camouflaged state to give players time to familiarise themselves with the map. During gameplay players could also share ammunition and fuel with friendly units and restock at base. Panther used vector graphics, themselves not new, to render the 3D environment in crisp detail with an impressive amount of depth. Explosions were further enhanced with the use of a special character set to enable raster graphics (the type of images displayed by a cathode ray screen, image files such as jpg are also raster images) animation. The sharpness of the graphics was helped along by the fact that the game map was largely the same every time, a flat plain with five mountains. These mountains would change size and placement each round to keep things fresh. As is the case with many games of this era, the legacy is a long and storied one. The US Army developed a version of Panther called Panzer which was more sophisticated but about which I couldn’t find any substantial information. Of more interest however is the fact that Atari used to have a PLATO account and their immensely popular tank battling arcade game Battlezone is, if not a direct descendant, then at least a cousin of Panther. While information is scarce on Panzer we do know that the US Army contracted Atari to create a modified version of Battlezone as a training program for gunners of the Bradley Fighting Vehicle in late 1980. Panther was not only of interest to Atari but featured a sweet title screen too. The same year Panther was released another first-person adventure was also furthering first-person gaming. Moria, obviously named after the location in Tolkein’s Lord Of The Rings series, wasn’t the first RPG, 1974’s Dungeons & Dragons would take that honour. 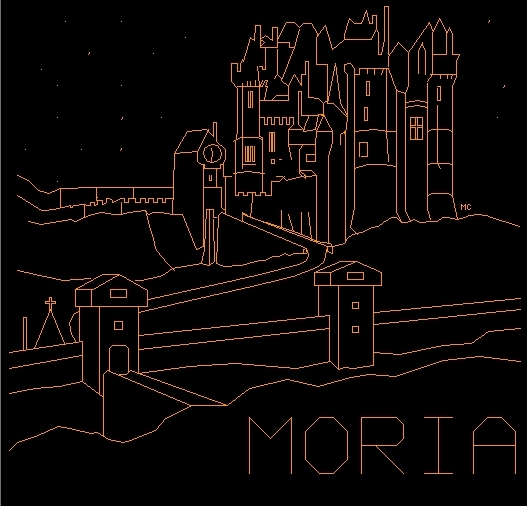 But of importance to us is the fact that Moria was the very first first-person role playing game. Development started in 1975 with Kevet Duncombe and Jim Battin, development would continue until 1984 constantly adding new features and refining existing ones. Moria also is a bit of an oddity – neither of the developers had read Lord Of The Rings or were aware of Dungeons & Dragons and so Moria has some unique quirks to it. The players have four statistics; cunning, piety, valor, and wizardry. Each start with fairly low scores (one 10, two 7s, and one 5) but would increase with use, a feature that will be most familiar to modern gamers via the ever popular Elder Scrolls series of role playing games. Similarly influential, at least to survival games, is the need for the player character to eat and drink during their adventure. Players do not level up or gain experience points while playing Moria and instead progression is enabled by finding and equipping new items and increasing the base stats. Also of interest is the fact that characters age in real time. Food and water supplies come in month long units, which equates to about eight minutes of real time. Unlike many role playing games, this timer is constantly running and not based on the amount of moves the player makes. Death is permanent, but a character that dies of old age can pass their items on to an heir, allowing your next character to start with a bit, or a lot, of a boost. Moria also features a host of other unique functions for the time such as a 242-area world (split between town, wilderness, and four dungeons (each with 60(!) floors), a kind of proto-active time battle (ATB) system where enemies could continue to take turns in combat when your turn is available, and getting recommendations from shopkeepers based on how much you tell them you want to spend. Moria is a very advanced RPG for its time, the like of which wouldn't be seen in the mainstream for well over a decade. The game also features two distinct spell lists, one for the piety stat (called prayers) and one for the wizardry stat. The spell/prayer list is limited but offers interesting functions like walking through walls. Casting spells or prayers however drains the limited pool of vitality (health points essentially) and will result in death, or a weakened state, if overused. Vitality however replenishes over time, and a canny player can just stand in a safe, or even relatively safe, spot and wait for it to recover. To the best of my knowledge, Moria is also the progenitor of the mark and recall system of fast travel that would be a staple of CRPGs for years to come. In Moria players can place a string on a location and follow it back at any time. Also allowed is impromptu assistance from other players; when in trouble a player can yell for help and other players get the opportunity to assist them immediately. Party members can also talk freely to the whole group or whisper privately to single members. Another feature that would be immediately familiar to Elder Scrolls players is the ability to join a guild. Each of the four stats essentially represents an archtype or class, and there is a guild for each – the Brotherhood, Union of Knights, Thieves Guild, and Circle Of Wizards. Unlike Elder Scrolls however, players in Moria require a certain amount of skill points in the appropriate stat to join their guild of choice. Being a member of a guild confers additional benefits to the player character such as improved fighting ability or teleportation. Players can donate to these guilds to rise in rank. It’s not all wandering around murdering the wildlife and giving away the loot to guilds though. There is an objective; Finding the Reapers Ring. When the game is initially set up the ring spawns in a hidden location somewhere on the first floor and players must search it out. Finding the ring causes it to relocate to the next floor down until it comes to rest on floor 60 of the dungeons, effectively making the game harder for everyone whenever someone wins. That brings our tour of the first half of the swingin’ ’70’s first-person gaming scene to an end. We’ve seen tank wars, space battles, so, so many mazes, and even one of the most unique RPGs ever made. It’s been a bit of a whistlestop tour – there are countless games we haven’t even named just on the PLATO system and countless influences throughout the coming years that we haven’t even touched on but even from this look through the keyhole to the past it’s possible to see that gaming innovation didn’t start with the rise of the arcades or home computing but mainly at the University Of Illinois where students had far more time, imagination, and motivation to step into the great virtual unknown than at any other point in gaming history.